She loves modern, while he’s all about vintage. Elaina Bellis is the quintessential California girl. The art director and creative is the epitome of effortless cool, and her Burbank home is the ultimate extension of her style. The dreamy space is characterized by an abundance of natural light coupled with saturated splashes of color and a curated array of decorative accents with sentimental value. For all the bright pops of color and lighthearted flair, you will find an equal dose of daring moments that counter the apparent carefree aesthetic. Accent walls are manifested in the form of a bold splash of black paint set against a high-contrast surface or finish—a chromatic motif that is applied to the master bedroom and bath. An eclectic mix of vintage and contemporary furnishings further accentuates the unique decorative direction of the home, one that is a clear representation of Bellis’s signature style as well as her husband James’s. As luck would have it, the previous owners were interior designers who had taken on a great deal of the home’s renovations—the kitchen and bathrooms being two prime spots. The tiling above the range, in the kitchen, comprised a series of Heath Ceramics tiles, which the design duo sourced from Craigslist. The dining room’s light and airy feel can be attributed to the seemingly pared-down decorative aesthetic that’s more in line with Bellis’s preferences. The white walls serve as a canvas of sorts, providing a high-contrast backdrop for the cluster of greens that immediately pop. The packed built-in shelves naturally fold into the room’s design, courtesy of the light wood finishes emulated by way of the furnishings. All the art in the home, as well as the photography, is either by James (Bellis’s husband) or his father, Bob Branaman. The master bedroom serves as an oasis of sorts, one that combines Bellis’s unique aesthetic with an unapologetic burst of color—courtesy of James’s influence—accentuated by the abundance of natural light throughout. When it came to decking out the twins’ room, the space bore no shortage of color or personality. A rainbow of books, toys, and objects provided the stark-white room with a playful element, one that would allow the space to grow and transition alongside the little ones. 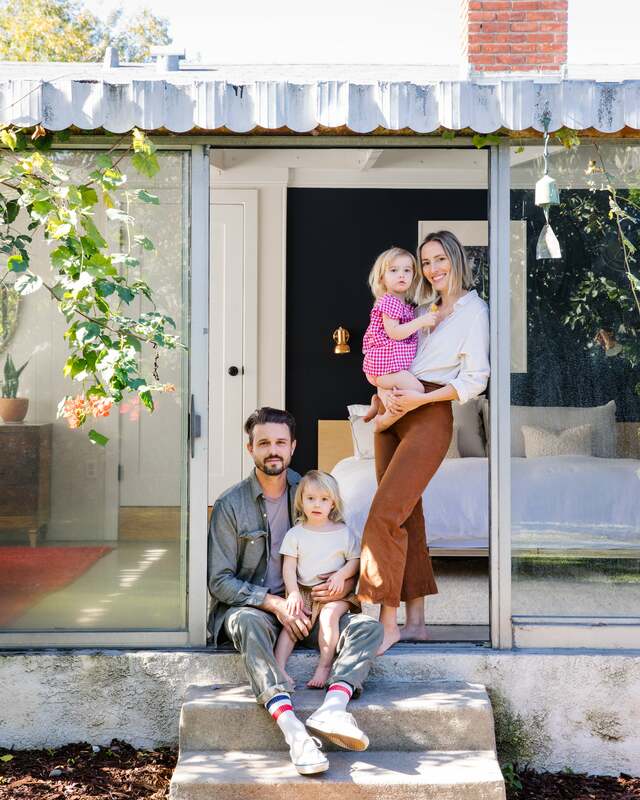 The overarching aesthetic of the home embodies a blend of mid-century modern with a storied vintage vibe, a seamless byproduct of the couple’s unique styles.